At times corduroy can be like marmite – you either love it or you hate it. Me personally? I love it! It’s already featured on the blog in my texture mix post and its here again. It does come with a stereotypical image of being ‘granddad’ or ‘school teacher’ vibes so people automatically steer away from it without even considering, but with the current season bringing out all the much tailored and streamlined corduroy pieces, I just want everything in the fabric really. I’m not going to lie it’s not easy to find the perfect pieces, I’ve found that the fit is extremely important so that you don’t fall down that forbidden granddad look (no offence to granddads – you have an amazing style, but just for your genre lol) It took me a lot of trying on in stores to get that perfect fit trouser finding that either a straight leg or a wider leg looks the most flattering, if you want a more ‘put together’ look than casual, which is a great helping hand in making you look taller as well. Blazers in corduroy are everywhere too and it’s the perfect way to add the fabric into your wardrobe without any malfunctions because of it being a specific tailored piece already, so if you’re a little on the fence about corduroy then a blazer is a good piece to start with. Corduroy for me is like a print, like I mentioned in my previous post – adding a print into your outfit when you don’t have enough time instantly adds character and corduroy is like that too. I can be sure to have a basic outfit and could just throw on a corduroy blazer and it instantly makes it look ‘cooler’. 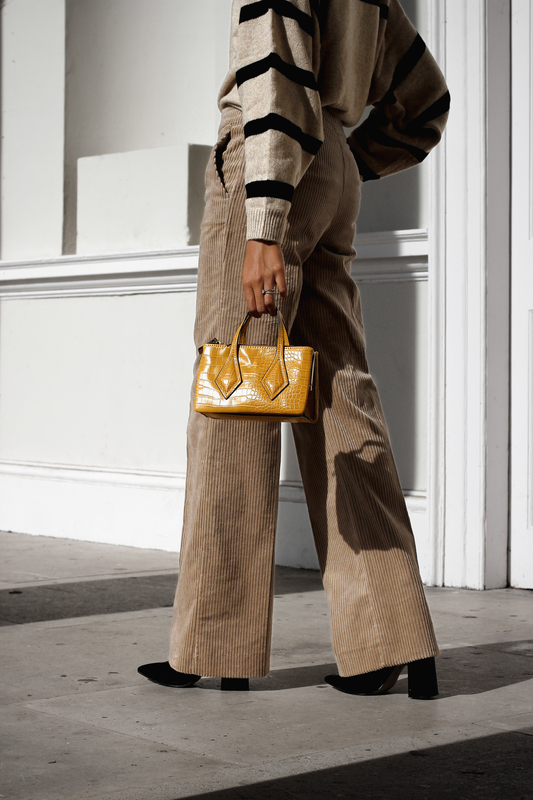 My personal favourite is corduroy trousers with a knit – its simple yet looks on trend with the texture mix, fuss free and comfy! What are the thoughts on corduroy – do you love it? Or are you steering clear? Oh, here to staaaaay, please! You look SO stylish in this material and while I’m here, I’ve just got to point out how utterly chic you are in general – wow!